A little thing I made because I realized how many people seem to think Asatru is a dead religion, or just for silly "heathens" who want to play make-believe in the woods. 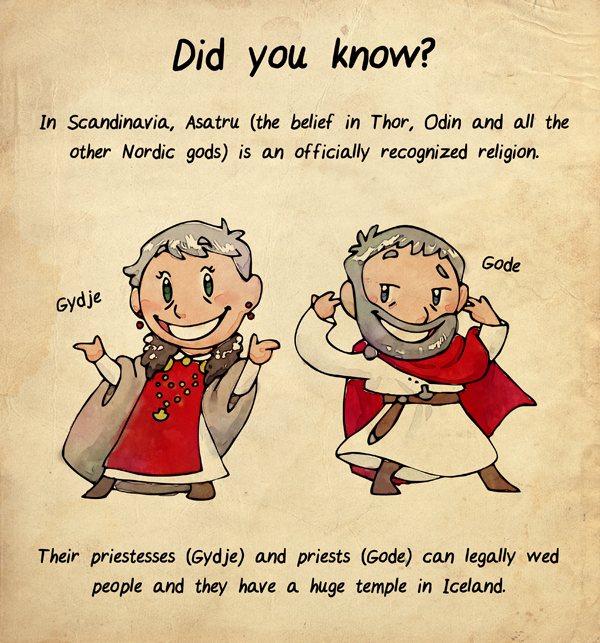 I'm an American who believes in Asatru and as such I can confirm it is not terribly common as we lack churches and such in the states (that I know of) but it'd be amazing if we had such things! I'd kill to go to a church instead of the loose gatherings we have currently. @Kitom Well bear in mind that before the coming of Christainity, the norse belief wasn't super organized and was more individual/family based. It allowed for different variations shaped by place and experience. I like the notion that everyone had their own takes but respected everyone's faith. As a fellow Asatru Heathen I take lots of pride in the fact we are being recognized at all. Asatru is one of the few pagan religions that even has a church at all. oh also long time reader, first time commenter. Love your stuff. I also believe in Greek, Chinese and Japanese mythology. My boyfriend and I are both practicing Asatruar, and we are planning a trip to Iceland next year to go to the temple! Asatru has official recognition in the United States, too. Since we (I'm American) have the First Amendment, recognition isn't official in the same way as it is with other countries. It would be illegal for Congress to pass some sort of resolution officially recognizing it, for instance. It's usually a bunch of more subtle things, like tax status. For instance, The Troth carries the tax status of a non-profit religious organization. The Army has said that they will allow soldiers to identify as Asatru or Heathen, though there's been some difficulty with implementing that. Already, the family of deceased soldiers can select an armed forces-provided tombstone with a hammer of Thor symbol. There was a court case involving Asatru prisoners, and the ruling was that the prison system, as a government entity, cannot deny the prisoners an emblem of their belief. While anything involving prisoners is always a little dicey for heathens (given connections in the prison system to white nationalism), it does show government recognition of Asatru believers having the same First Amendment rights as other believers. Who can legally wed someone varies by state, since marriages licenses are managed at the state level instead of the federal. However, I would be shocked if any state prohibited a gothi from conducting a legally binding marriage for reasons of belief. They'd probably just have to jump through a few legal hoops and pay a fee to get licensed, the same as a Christian minister. Of course, the same can also be said for Scientology, so it isn't like the US government is particularly picky! I feel that the world would be a lot cooler if Greek/Roman polytheism had become the prominent religion in Europe instead of Christianity. Not only would the religious parts of European culture actually be European in origin but polytheism generally seems less able to maintain dogma, less able to prevent advancements in science and culture, less divided and more accepting of other religions. It could have merged with Scandinavian and other European polytheist religions to create a European equivalent to Hinduism. Here's the thing: Christianity and especially its ability to maintain dogma pretty much made the later technological and societal development of europe possible in the first place. Without the structures and frameworks it established, without clear lines of communication across borders and ethnic or cultural divisions, without an established stock of educated people with free time on their hands, a common language and a tradition of scholarship, the later advances that the church tried to fight would probably not have taken place at all. Constantine adopted Christianity for the roman empire he was desperately trying to stabilize because he could see the benefits of having a single, organized religion in charge instead of squabbling priesthoods of who-knows-how-many gods (most graeco-roman deities were syncretistic mixtures of several older deities, and there were huge differences in how each god was viewed between regions). Once the church got itself established, its structures allowed parts of the ancient world to hang on through an unprecedented period of socio-political upheaval. Roman polytheism had already started to fray at the edges and would almost certainly have collapsed under pressure. Thank you for this. Love your work.